So... new priorities, new responsibilities, new ways to find time and motivation for the project. Among the progress of this last month there were 2 things that I can show you without spoilers: The new map system and the new subscreen. Samus looks gorgeous and detailed thanks to very talented people from the forums. For those who like to know where items are, now the map shows their location. It´ll be optional. The subscreen now displays a more detailed Samus picture. If you select any of the upgrades located in the lower half, the image scrolls down to show its location. The map system was expanded a lot. Now it has some more variety on room shapes, you can place a marker manually and have the direction shown in the HUD minimap. Also, items and discovered Metroids are displayed too. The items display (Zero Mission style) will be optional, I´m still not sure if I should make it a game option or dedicate map rooms for those coordinates in each area. The logs screen is being redone. Besides having the logs divided in categories, now the logs aren´t limited in length as before. You can scroll the text now, this will make certain logs more expansive, and will prevent a lot of localization headaches. The project is being worked on, I still find time for it. I want to thank all the awesome people who gave me their blessings, their positive thoughts and congratulations. This is a very special moment in my life, and it´s a great relief that you took the news with such respect and happiness. To all of you, thanks! I´ll post here before the holidays, hopefully with some more screenshots. The year was 1991 and Nintendo's portable console, Game Boy, triumphed without equal. That year went on sale the second game of the currently very popular Metroid series. Its title was Metroid II: Return of Samus, and told us the story of Samus Aran new going to solve the problems of the failed mission to the planet SR-388. Fourteen years later, Milton, a young adventurer of Argentina, proposed to create a remake of this great game from scratch. Using as a primary tool Game Maker and driven by the dream of playing Metroid II with the graphics and the physics of Metroid: Zero Mission, managed to mount a more than interesting. It has been six years since that beginning, and today a playable demo and a video that touches the 500,000 hits on YouTube, DoctorM64 is in the final stages of their child. 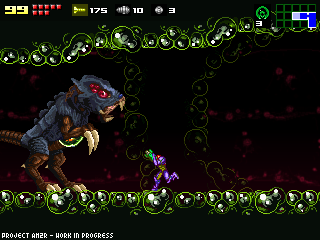 Generously provided us an interview for all those who knew not the existence of this project, or want to read news in Spanish on it, AM2R not know any other remake of Metroid 2 that is keen to ensure you can get a great result. How did the project to create AM2R and what impact did it take? Although he had made a platform game in the past, gave me to do some simple remake of a game. Using Game Maker to develop games, and while not the best choice in performance and portability, you can get very fast and functional results with little effort. By the way helped me to start getting into programming. The project began as a very simple, but used fangames graphics from other games in the series. Gradually took shape as you add different skills to the protagonist, always focusing on the engine rather than the content. For when did the public project, a couple of years, fans of the Metroid series did with the "word of mouth" that appear in stories AM2R recognized sites like Destructoid and Kotaku. I started to receive offers from artists to give me a hand, until then had been doing it all alone. Today there are two artists working on a redesign of the creatures, and another by the design of mechanisms and multiple environments. While there are a couple of musicians who contributed musical arrangements, I myself am producing the soundtrack, since I am sound technician, I have a recording studio and rehearsal rooms. Today there are people who collaborate in the forum with suggestions, text translations, discussions on the reference material, the series itself, and how the game will be presented. Why did you choose to Metroid 2 as fortunate for the remake? Boy was hung, I got bored very easily. There were games I get more attention, like Wario Land and Tiny Toons 2 because it had higher short. When I played Metroid 2, I lost, I became frustrated and left it for several years. Found big business in a gallery a few video game cartridges that had not played, and I could buy a Super Game Boy (adapter to play Game Boy games on SNES). There I decided to finish it. Turned out not to be so complicated after all, provided you have a sense of direction and not spend much time between games. The first game I did was a remake of a fighting game quite unknown. He had good reception. He had made a couple of fairly simple games with Game Maker, and wanted to make something more interesting. 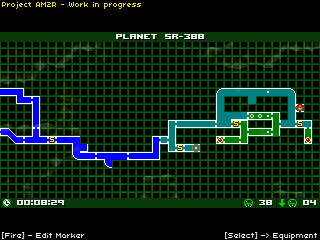 When I finished Metroid Zero Mission told me "would be cornered play Metroid 2 with this rhythm, and a map." That's how it all began. How AM2R suffer, and at what stage is it? The only serious problem was the loss of a hard disk a few months ago. I have backups of the entire project scattered everywhere, but the disk I lost was my studio. Apart from finishing with a pair of angry customers who lose their jobs for months, I lost the soundtrack projects. Premixes had some issues, a couple videos appear on YouTube. The rest of the songs were half finished. On the other hand, start over from scratch was not bad. I was on another disk sound banks and presets used, and it was good to do everything with a fresh perspective. I get to imitate the style of the soundtrack of the Metroid Prime series much better than before. You can hear some of the issues in the demo. The rest of the potholes that were strictly AM2R suffered lack of time for personal matters. Since this is a hobby, anything that life puts me ahead will take me time to devote to the project. I am currently in full production of content. The engine is ready, all map screens are made whole and, in some areas remaining enemy positions, touch up some funds, add hidden items, and lots of beta testing. A lot. Actually I have no idea of ​​a date, it is important that the project is in motion and will eventually end. What if Nintendo will knock on the door telling you they want to port your remake for distribution in the e-shop? It's as if you asked me "What if Zaira Nara comes and invites you to dinner?". I know it's unlikely, but if for some reason was given, I would say "There you go!" both cases. I always wonder if the game is going to behave to another platform. The only platform I'm considering is a port for Mac, because there is a version of Game Maker for that platform. At the moment the priority is to finish the game. While not rule out the possibility of ports from scratch, I would like to have all content ready to see if feasible, or to see how serious complications. Once finished, do you think abocarte another remake or a game of your own? I have the odd notion floating around to make a game of exploration. One idea I have for some time is to make games with good amount of content to iDevices. There are many mini-games and, to my knowledge, few serious games with complex stories, or at least with many varied levels to explore, something on the scale of Castlevania: Symphony of the Night. Who knows ... one day. DoctorM64 We thank you for giving us these words. We hope you can finish this project as soon as possible so we can incarle the tooth once and for all. Also, can try their demo and see the previews in the respective site and YouTube channel. Do not miss it because it's fantastic. Good luck, Doc! The new map screen is awesome! Great Work Thanks again ! This is looking awesome! Please don't stop before it's finished! Nice work on the subscreen. Enjoy the holidays Doc. Awesome work man!! LOVE the new design! Keep up the good work! Hombre, tengo tu blog en la barra de favoritos, y le hago click, te lo juro por dios todos los dias desde el año pasado, y se me llenan los ojos de luz y mi corazon empieza a agitarse progresivamente cuando veo que posteas algo nuevo. Can we get a download please...? Además también quería felicitarte de nuevo por el progreso hecho en el proyecto, realmente se notan los cambios y se ve que todo ha sido para bien, un saludo! Whoa-ho!! !Te pasaste por nuevo, macho! And I really am intrigued by those log entries. I can't wait to see what kind of story you give to SR388. My favorite part of the Prime games was the scan system; namely the option to learn more about the story and the world if you wanted to. I'm glad to see this option return in this remake. It will give the previously bland world of SR388 some life. I just love the fact that instead of just remaking the game, your adding so much polish that this remake is going to shine brighter then the sun when it's done. I'm about on the same page as Omega Ridley. You can only redo different parts of the game so many times... let's get a release already. This is awesome! Keep up the good work,this is the best project I've seen so far! Can I just say I LOVE the map? With the curves and the map markers and optional item locations... Doc you're doing what Nintendo should've done a looooooooong time ago. Why aren't you the heir to the metroid empire again? 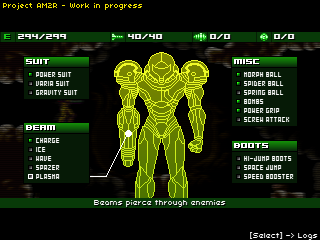 I don't think there's a gravity suit in Metroid 2. But, it looks awesome, nonetheless! Where's the 'Like' button for this?! :) Awesome work as always! Siendo un perfeccionista que le dedica mucha atención a todos los detalles, creo que sería una lástima que lances el juego sin perfeccionarlo. I'm a fan of the metroid saga, and what you're doing right now is just wonderful!!! I can't wait (yes I can but it's hard...) to play your remake! Thx to you doing your best for us, and thx to your friend helping you! I JUST discovered this project and I just wanted to thank you for taking on this awesome project. I will play it the day it is released. Best of luck to you! As a follower of the project for quite some time now, I could say I'm your fan already. And as such, I'm more happy for your daughter, you and your girlfriend than any game around. Please take your time with it Doc, and enjoy what probably will be for you the best christmas yet, with your family. I gotta ask you...there's a particular verion of M2 with a missing Alpha in the ruins...makes the game IMPOSSIBLE to beat without cheating. Will you/have you fix(ed) that?